The presence of jazz in metal music seems to be an increasingly popular trend. Most noticeably, it’s the addition of the saxophone that’s often just enough to make us think that the band has successfully merged the two genres into one, but most of the times it’s just a clin d’œil to it, and the music itself doesn’t bear any of the subjacent characteristics of jazz. The first ones to incorporate jazz, in a form or another, into metal were Atheist, Meshuggah, and Cynic, back in the early ’90’s. Since then, it gained in popularity and it’s now in almost any metal subgenre you can name, but I’ve never actually heard a sludge metal jazz fusion. 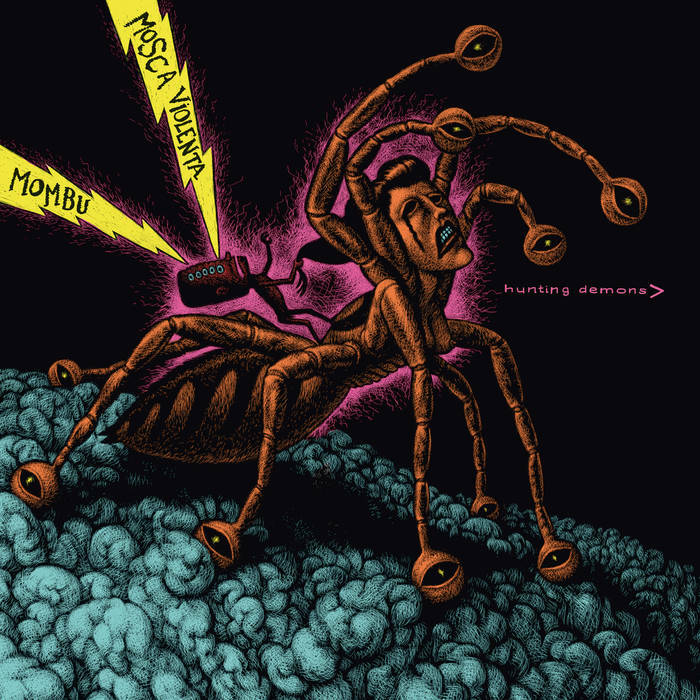 My baptism here comes from a collaboration between Mombu and Mosca Violenta with their conjoint album Hunting Demons. Both bands were already making some sort of jazzy metal music beforehand, but they came to my attention only now, and they’re slower and heavier than ever. Here’s Mombu with their song “Mombu Storm”, live in studio. And here’s the Mosca Violenta trio, previously known as Les yeux de la tête. Together, they boast a similar lineup to Trioscapes: drums, bass, and sax, but with supernumerary saxophonist and drummer. The sax used are two baritones, for riff-like melodies, and an alto for solo, lead and harmony sections. The bass is less explorative than Dan Briggs’s in terms of tone and effects, but it serves as a solid bottom line around which everything revolves. With distortion, it gains a grittiness that makes the lack of guitars almost unnoticeable. The riffs that the bass plays are intricate and involve lots of chords and higher notes that further makes it independent. But what really replaces the guitar is the two saxophones: they can play in harmony to create the same effect as power chords, staccato for palm-mutes, and their baritone range make them similar to a 7-string guitar (usually, they can go as low as C2). It’s pretty hard to make out one drummer from the other, and I believe they played not too differently. If it’s not the case, they’re really complementing each other seamlessly. In conclusion, Hunting Demons is a very interesting album, doing metal in a new way and pushing the boundaries of genre-crossing. It’s not for everyone, but fans of experimental, low, and slow metal will become instant fans.